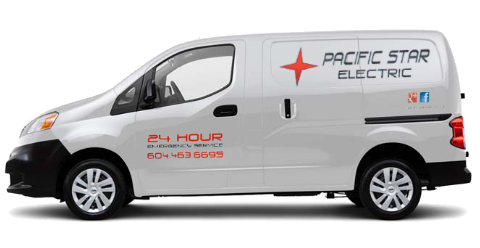 Pacific Star Electric | Electrical contractors in Maple Ridge providing professional renovation, restoration and commercial/industrial electrical services in the lower mainland of Vancouver BC Canada. We provide top-quality work, competitive prices, and absolute professionalism while conducting ourselves with integrity in all circumstances. Why choose Pacific Star Electric? Pacific Star Electric is committed to providing our customers with outstanding service. When you hire us, there are no surprises. We will only do the work that is necessary and we’ll do it in a timely and efficient manner. We will communicate clearly with you to explain what we are doing and why it needs to be done. We will tell you in advance what the costs will be. We will be there when we say we’ll be there. If the unexpected does happen, and we can’t be there on time, we’ll call you right away. We guarantee our work. If you are not satisfied, we’ll work with you to ensure that everything meets your expectations. We believe that jobs should be done right the first time. At Pacific Star Electric, we are proud of our work. Call us today for a free assessment of your electrical needs. We are sure you will be pleased with the results. For more information about insurance coverage and licensing, please go to our About Us page. Call us today and one of our expert service technicians will come out and promptly solve your electrical problems. Pacific Star Electric has extensive experience in residential renovations. From ceiling fan installations to kitchen renovations, we can help with any of your electrical needs. Building a new home or office space? Pacific Star Electric has the knowledge and expertise to optimize your new electrical systems. Pacific Star Electric has extensive experience providing restoration services that get your home or business back on track. Electrical contractor serving the Lower Mainland of BC including Abbotsford, Agassiz, Aldergrove, Anmore, Belcarra, Burnaby, Chilliwack, Coquitlam, Delta, Hope, Langley, Maple Ridge, Mission, New Westminster, North Vancouver, Pitt Meadows, Port Coquitlam, Port Moody, Richmond, Squamish, Surrey, Vancouver, West Vancouver, Whistler & White Rock.